Poorly executed, great concept. These are the words that come to mind when it comes to the newest film by the director of “Donnie Darko”, Richard Kelly. Any one who has watched “Donnie Darko” understands that the ideas that come to Kelly’s mind are portrayed in a strange, almost mystical manner, with a hint of dark humor. This time around, Kelly remakes a short story, titled “Buttons Buttons” (by author Richard Matheson, author of I Am Legend) into a feature length film, a story that focuses around the mystery behind a box. Set in Virgina in the early 70s, this mysterious box is delivered to a young couple Norma and Arthur Lewis (James Marsden and Cameron Diaz) who have one son. The deliverer, Arlington Steward (the fabulous Frank Langella) is a survivor of sorts who was struck by lightning and was permanently and visibly scarred. They are given the choice to press the button that is on the box and receive one million dollars — the catch being that it would cause the death of someone they would not know – or receive nothing. Having recently ran into money problems and career disappointments, Norma decides to (almost instantly regrettably) press the button. Mr. Steward comes back to retrieve the box, and a disturbing chain of events start to occur. As a fan of “Donnie Darko” and having attended the panel at Comic-Con for “The Box”, I had high expectations going into the theatre. Disappointingly, the film gets muddled with too much extra information, with background information diving into Arlington Steward’s character and the “employees” that the Lewis’ continually encounter. The employees are all controlled, one way or another, by Mr. Steward, and it is only speculated upon on who exactly employs Mr. Steward. These employees are at times, eerily comical. Whether or not this was intended is unclear, but the audience laughed often, every time one of the “employees” appeared. However, these were not the only scenes that caused laughter, there were many times, including the end that apparently, the people I was watching with found funny. We are presented with strange unexplainable scenes throughout, including one scene where Arthur meets Mr. Steward’s wife at the library, which failed to explain or reveal anything. It does lead to another idea, when we are presented with the possibility that we as humans are in Purgatory, that we are neither here or there. Whether this is true is never confirmed. Other details such as how Mr. Steward worked on the same Viking project as Arthur Lewis presents another idea that a conspiracy might be the direction of the film, or maybe some aliens decided to conduct an experiment by entering the body of Mr. Steward during the lightning strike. Whatever the details, the film fails. There is never enough information or explanation to understand what is going on in the film, and the main message gets lost in all of the distractions. What is the main message one might ask? The core of the movie deals with humanity, or the lack of humanity. The series of experiments were made to evaluate the morals and ethics of human beings, and that karma will always come back to hurt you. This is an unfailing topic of interest, and by the use of the Box and the choice that the Lewis’ were given, it’s a creative vehicle to tap into this idea of karma, and a “what would you do” kind of situation. Translate the 1 million dollars to 10 million dollars, and how many people today would press the button? It’s an interesting question. One will hope that the majority of people would not press the button, but there undoubtedly would be many that would. This is the question or the discussion that this movie should inspire. Instead, it just confuses. This question of ethics and consciousness gets marred when Kelly decides to bring in his “out there” stories, of which he introduces science fiction into the mix, failing to tell either part of the story well. Some people will no longer care about the box and will care more about who these people conducting the experiment are. In addition to the distractions, the movie moves slowly, easily losing one’s attention. 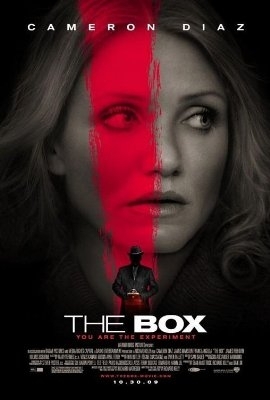 Given the fact that the underlying message no longer has a clear line of sight in the movie, “The Box” becomes the movie that “might have been”. I do think that the movie deserves a second viewing, without the distractions of rude, inconsiderate people laughing and talking around me, possibly giving me a more negative view than I might have originally thought. But I would be surprised if my assessment would change much, given its lack of good storytelling. I’d wait for rental. Neither this film nor “A Christmas Carol” lived up to my expectations. Another viewing of Michael Jackson’s “This Is It” would be a better way of spending this Friday night. Download the “Human Exploitation Resource” Manual, from the movie.